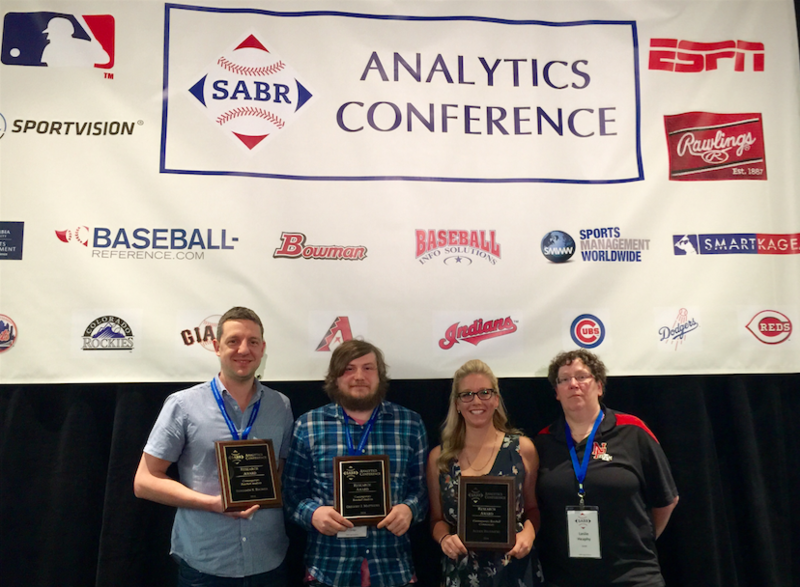 Ben Baumer, Alexis Brudnicki, and John McMurray were announced as the winners of 2016 SABR Analytics Conference Research Awards on Saturday, March 12 at the fifth annual SABR Analytics Conference in Phoenix, Arizona. Baumer, along with co-authors Shane T. Jensen and Gregory J. Matthews, were voted as the winners of the Contemporary Baseball Analysis Award for their article “OpenWAR: An Open Source System for Evaluating Overall Player Performance in Major League Baseball,” which appeared in the June 2015 edition of the Journal of Quantitative Analysis. Baumer is an assistant professor in the Statistical & Data Sciences program at Smith College in Massachusetts and a former statistical analyst in the New York Mets front office. Matthews is an Assistant Professor in Mathematics and Statistics at Loyola University in Chicago. Jensen is an Associate Professor in Statistics at the University of Pennsylvania's Wharton School. Brudnicki was voted as the winner of the Contemporary Baseball Commentary Award for her article “I'm Different. I'm the Same.”, published by The Hardball Times on November 18, 2015. Brudnicki is the lead baseball writer for the Canadian Baseball Network and the founder of the Turn Two Baseball Foundation. She has also written for MLB.com and Baseball America and worked with the Toronto Blue Jays in game-day production. McMurray was voted as the winner of the Historical Baseball Analysis/Commentary Award for his article “Examining Stolen Base Trends by Decade from the Deadball Era through the 1970s,” which appeared in the Fall 2015 edition of SABR's Baseball Research Journal. McMurray is the chair of SABR's Deadball Era Research Committee and Oral History Research Committee and vice-chair of the Baseball and the Media committee. He has written for Baseball Digest, Sports Collectors Digest, and many other publications. The SABR Analytics Conference Research Awards recognize baseball researchers who have completed the best work of original analysis or commentary during the preceding calendar year. To view all of the 2016 finalists, click here. Voting for the winners was conducted online from February 1-February 15, 2016, at SABR.org, BaseballProspectus.com, FanGraphs.com, HardballTimes.com, and BeyondtheBoxScore.com, with results weighted equally at 20%. This page was last updated February 12, 2019 at 12:23 am MST.